Last weekend, a mother named Candace Payne filmed herself on Facebook Live, wearing a Chewbacca mask that makes automated wookie sounds. The video went viral almost instantly, amassing 50 million views within the first 24 hours, setting a Facebook live record, which has now reached over 140 million views. 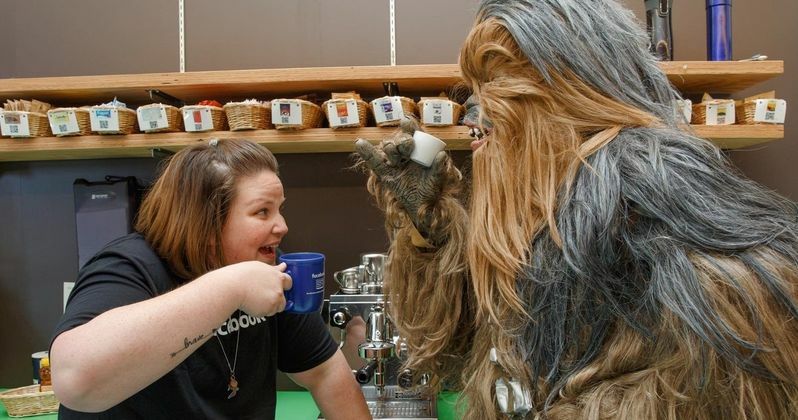 It turns out, the "Chewbacca Mom" has gained a few famous fans of her own, with a new video that surfaced from the Star Wars: Episode VIII set with one famous character watching the viral video. The Star Wars YouTube page debuted a new episode of The Star Wars Show, which opens with a special video from the Star Wars 8 set, where Chewbacca himself is seen watching the Chewbacca Mom video. We also get a glimpse of writer-director Rian Johnson, who reveals that he's seen the video and calls it great, while asking Chewie how many times he's watched that video. Over the past few days, Candace Payne has visited the Facebook headquarters and even appeared on The Late Late Show with James Corden, where she performed her own Carpool Karaoke rendition with the Chewbacca mask, along with a special guest, Star Wars: The Force Awakens director J.J. Abrams. In related news, earlier today, we showed you the first artwork for Star Wars Celebration 2016, which will be held in London this summer. The artwork featured characters from both Star Wars: The Force Awakens and the upcoming Rogue One: A Star Wars Story. The artwork actually debuted on The Star Wars Show, who revealed that the poster features a new Stormtrooper, known as the "Shoretrooper," who were reportedly referred to as "Scarabtroopers" on the set. This artwork also gives us our first look at a new variant of the classic AT-AT, known as the AT-ACT, which stands for All Terrain All Cargo Transport. Writer-director Rian Johnson recently revealed that they have passed the halfway point in production on Star Wars: Episode VIII, which still hasn't been given an official title yet. Last week, a rumor surfaced that LucasFilm is getting ready to announce the title will be Star Wars: Fall of the Resistance at Star Wars Celebration in July, but LucasFilm has not confirmed whether or not that will be the official title, or if the title reveal will happen at Star Wars Celebration. Earlier this month, there were three rumored title possibilities that surfaced, Star Wars: Echoes of the Dark Side, Star Wars: The Order of the Dark Side and Star Wars: The Tale of The Jedi Temple. Naturally, nothing has been confirmed yet, so we'll have to wait and see if the full title is revealed this summer at Star Wars: Celebration in London. The movie is set to hit theaters December 15, 2017, so stay tuned for more updates. In the meantime, take a look at this viral video from the Star Wars 8 set, along with the full episode of The Star Wars Show below.